Physical activity is any movement produced by contraction of skeletal muscles that increases energy expenditure. It is operational in seated, lying down & reverse Trendelenburg postures. The Gentle Jogger® is blue tooth enabled so you can control the device remotely from your mobile device. Track your steps, time and steps-per-minute over a period of time and move towards better health! Start now with our app. The Gentle Jogger® has a patented “tapping” mechanism that repetitively taps the foot pedals against a semi-rigid bumper to replicate physical activity such as walking, jogging or running. This “tapping” releases beneficial substances into your bloodstream. The Gentle Jogger® is created with constant mobility in mind. Whether you are sitting in a chair or lying in bed, there is no longer an excuse to not get those legs moving. Conveniently designed with a carrying handle and weighing in at only 10 lbs, take the Gentle Jogger ® with you anywhere and everywhere and make it part of your daily routine. Don’t sit Still! © 2019 Gentle Jogger. All rights reserved. Sackner Wellness Products LLC flagship product, the Gentle Jogger™ is a non-invasive, low-risk, wellness product not regulated by FDA (July 2016) and is not a medical treatment for any disease; Sackner Wellness Products does not represent that the Gentle Jogger is a cure for any disease. 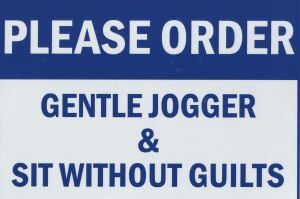 Pre Order Your Gentle Jogger Today!